Small volumes of anti-STRAD antibody vial(s) may occasionally become entrapped in the seal of the product vial during shipment and storage. If necessary, briefly centrifuge the vial on a tabletop centrifuge to dislodge any liquid in the container`s cap. Certain products may require to ship with dry ice and additional dry ice fee may apply. Description: STRAD a pseudokinase which, in complex with CAB39, binds to and activates LKB1. Relocates LKB1 from the nucleus to the cytoplasm. Plays an essential role in LKB1-mediated G1 cell cycle arrest. 3 isoforms of the human protein are produced by alternative splicing. Note: This description may include information from UniProtKB. Function: Pseudokinase which, in complex with CAB39/MO25 (CAB39/MO25alpha or CAB39L/MO25beta), binds to and activates STK11/LKB1. Adopts a closed conformation typical of active protein kinases and binds STK11/LKB1 as a pseudosubstrate, promoting conformational change of STK11/LKB1 in an active conformation. Subunit Structure: Component of a trimeric complex composed of STK11/LKB1, STRAD (STRADA or STRADB) and CAB39/MO25 (CAB39/MO25alpha or CAB39L/MO25beta): the complex tethers STK11/LKB1 in the cytoplasm and stimulates its catalytic activity. Similarity: The protein kinase domain is predicted to be catalytically inactive. Belongs to the protein kinase superfamily. STE Ser/Thr protein kinase family. STE20 subfamily. 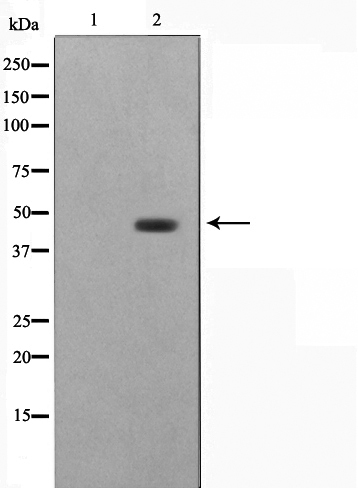 Western blot analysis on HepG2 cell lysate using STRAD Antibody, The lane on the left is treated with the antigen-specific peptide. 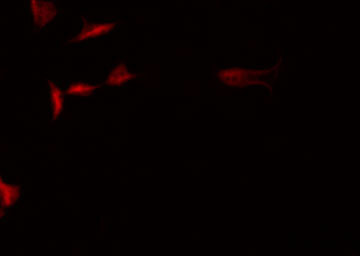 MBS9600427 staining HepG2 by IF/ICC. The sample were fixed with PFA and permeabilized in 0.1% Triton X-100, then blocked in 10% serum for 45 minutes at 25 degree C. The primary antibody was diluted at 1/200 and incubated with the sample for 1 hour at 37 degree C. An Alexa Fluor 594 conjugated goat anti-rabbit IgG (H+L) Ab, diluted at 1/600, was used as the secondary antibody. NCBI/Uniprot data below describe general gene information for STRAD. It may not necessarily be applicable to this product. Pseudokinase which, in complex with CAB39/MO25 (CAB39/MO25alpha or CAB39L/MO25beta), binds to and activates STK11/LKB1. Adopts a closed conformation typical of active protein kinases and binds STK11/LKB1 as a pseudosubstrate, promoting conformational change of STK11/LKB1 in an active conformation. 1. We identified for the first time a homozygous point mutation in STRADA causing PMSE. Additional bi-allelic mutations related to PMSE thus far have not been observed in Baylor approximately 6,000 consecutive clinical WES cases, supporting the rarity of this disorder.